Tomorrow is Thanksgiving, so I thought I’d mix it up and share 10 things I’m thankful for – some things are significant, some less so. But big or small, it does us a world of good when we give thanks. I try to focus a lot on thankfulness – I’ve written blog posts before about how thankfulness leads to greater success at work and have shared my take on the difference between happiness and thankfulness. 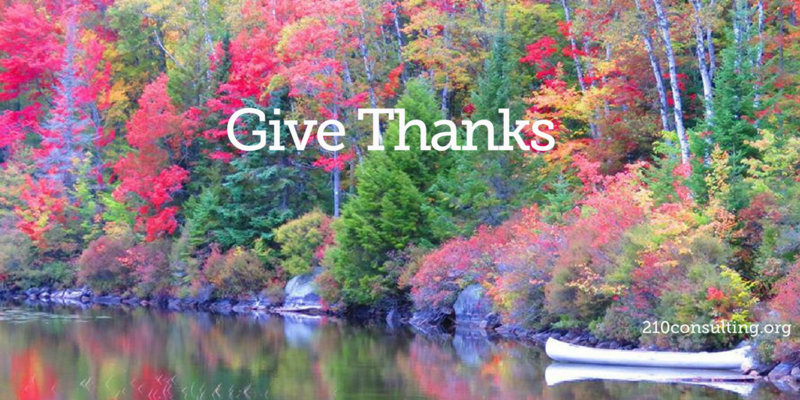 I have a whole Giving Back page on my website that has thankfulness as the theme. That’s because both science and scripture agree thankfulness is critical to our wellbeing. There are approximately 169 references to giving thanks in the Bible, and check out Amy Morin’s good article on 7 Scientifically Proven Benefits Of Gratitude That Will Motivate You To Give Thanks Year Round. God’s unconditional love and grace – new every morning. For the uniqueness of people in this world – we’re not all the same, and I like that. That we’re each custom-designed to make an impact in this world in our own unique ways AND we can and do make a difference. I love what I do and the clients I get to work with – helping them discover their talents and choose career paths they’ll love is my mission and passion – my way to make a difference. And it’s a whole lot of fun too! My husband David – he’s thoughtful, committed to the Lord and our family, and a true servant leader. Our five awesome kids that we LOVE to hang out with – such a treat to have them all home for Thanksgiving! My family heritage – I wrote a tribute to my mom as my hero in this blog post, and I could do the same for my father – he has been a true example of character, commitment, and loyalty. Our puppy Missy – she brings such joy to our hearts. This beautiful world – blue skies, green meadows, and daffodils – mountains – the beach. God didn’t have to make our world so beautiful but He did – see: grace. Little sparks of happiness in the midst of each day – this week, my sparks were L’Occitane Lemon Verbena soap, this silly Rudolph the Red Nosed Reindeer that plays music, and a vase of yellow Gerber daisies that my husband bought me –it’s the little things that can brighten a long day. Wishing you and yours a wonderful Thanksgiving tomorrow, but even more so, hearts full of thanksgiving every day.